Follow I-5 N to exit 28. Turn Left on La Jolla Village Dr. Turn Right on Via La Jolla Dr. Turn Left onto Gilman Dr. Follow I-5 S to exit 28. Turn Right on La Jolla Village Dr.
at the corner of Villa La Jolla Dr. and Gilman Dr.
Department of Pharmacology Follow I-5 S to exit 28. Follow I-5 N to exit 28. University of California San Diego Turn Right on La Jolla Village Dr. Turn Left on La Jolla Village Dr.
9500 Gilman Dr., BSB 3082 Turn Right on Via La Jolla Dr. Turn Right on Via La Jolla Dr.
La Jolla, CA 92093-0636 Turn Left onto Gilman Dr. 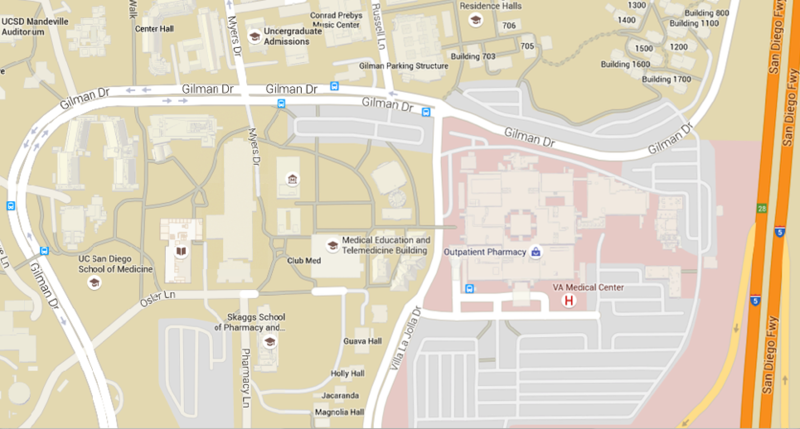 Turn Left onto Gilman Dr.
Email: wjoiner@ucsd.edu at the corner of Villa La Jolla Dr. and Gilman Dr.